Honduras is the most dangerous country in the Americas for journalists and they say things are getting worse. Harassment, suspicious phone calls, and restricted access to government sources have become routine for Honduran journalist and human rights defender Dina Meza, who says she is one of many media workers threatened for challenging authorities in her country. Honduras is one of the most dangerous countries in the world for journalists, according to Reporters Without Borders. The group ranked Honduras 141 out of 180 countries on the 2018 World Press Freedom Index. Dangers for journalists include physical attacks, threats, and abusive legal proceedings, Reporters Without Borders said. Meza, the founding editor of alternative digital magazine Pasos de Animal Grande, which specialises in investigative coverage of human rights issues, knows these threats firsthand. She has repeatedly suffered threats of sexual violence and against her life, as well as surveillance and other forms of intimidation, such as unusual late-night phone calls. The threats forced her to spend months outside the country in 2013. As a safety precaution, Meza often is flanked by a pair of international human rights observers provided by Peace Brigades International when she works in the field on investigations or reporting outside of the capital, Tegucigalpa. Violence against journalists has spiked in the wake of the 2009 US-backed military coup that removed former president Manuel Zelaya and paved the way for current President Juan Orlando Hernandez, who is often criticised for prioritising the interests of multinational corporations over the Honduran people. At least 62 journalists have been killed in the country between 2006 and 2017, according to data from the Commission for Investigation of Attacks on Journalists of the Latin American Federation of Journalists. Only two of those killings happened before 2009. In the same period, murders of land and environmental defenders, human rights activists, LGBTQ people, and other vulnerable groups have also increased. The statistics make Honduras the most deadly country for journalists in the Americas per capita. Only Mexico rivals Honduras with 165 journalists killed from 2006 to 2017, according to the federation. Meza also heads a project with the Association for Democracy and Human Rights (Asopodehu), which supports at-risk media workers and offers training to young journalists. She told Al Jazeera that Honduran authorities use the climate of fear caused by violence against journalists to their advantage. “This violence against journalists creates a lot of self-censorship,” Meza said. This self-censorship accompanies de facto bans by Congress and other official spaces for adversarial journalists, Meza who considers herself banned, said. During the 2009 coup, the government suspended constitutional guarantees and imposed a media blackout. Cesar Silva, a television reporter with UNE TV, a two-year-old channel that has been critical of Hernandez’ government, said the coup was a defining moment for journalists. 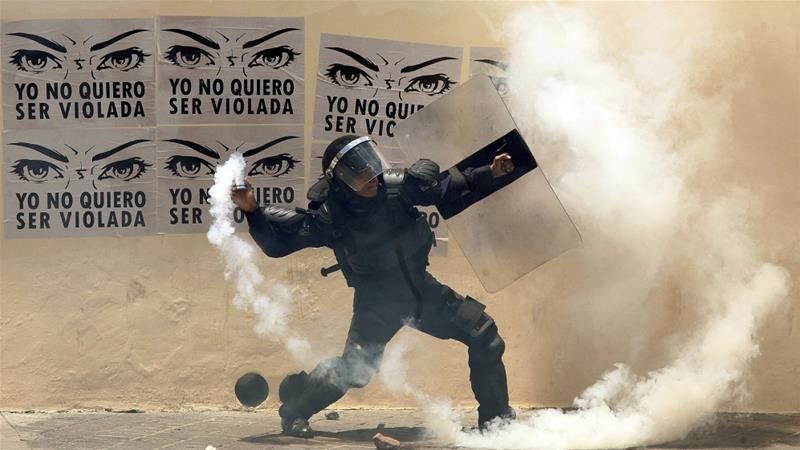 As Honduran media glossed over Zelaya’s removal as a “constitutional substitution”, a tiny minority of journalists reported on the popular uprising and violent military crackdown on the streets. Months later, Silva was abducted and tortured for two days after releasing footage of post-coup repression. He was forced to flee the country but returned several months later to continue reporting, despite the dangers. “From the time we wake up, begin our work, leave our houses – there’s a risk,” he said of his UNE TV team. Like Meza, Silva has been denied access to Congress and other state institutions. He said press freedom continues to worsen. Last year, Hernandez won a second term despite widespread allegations of fraud and controversy around his re-election bid. Honduras plunged into its worst political crisis since the coup. Silva’s UNE TV was the only local television channel that broadcast the police and military crackdown on the anti-fraud protests that shook the country for weeks following the November 26, 2017 election. During a live broadcast in January, soldiers beat Silva and his colleagues and smashed their camera equipment. In February, a man attempted to stab Silva while he was on the air. “The conditions are more difficult every day,” Silva said, decrying the targeting of independent journalists in both physical attacks and smear campaigns by mainstream media. “What motivates us is that we are on the right path. Our beacon is the truth,” Silva said. Last year, Congress reformed the penal code to punish journalists with four to eight years in jail for “apologising for terrorism”. Critics slammed the reform, known as Article 335-B, for targeting reporters who refuse to toe the government line or be “bought off”. A separate reform broadly redefined “terrorism” in a way opponents said could criminalise social protests at judges’ discretion. The public prosecutor’s office shot down Article 335-B as unconstitutional, but its future hinges on the Supreme Court. More recently, Hernandez’ allies in Congress promoted a cyber-security bill aimed at regulating “acts of hatred and discrimination” on the internet. Civil society organisations blasted the bill as a “gag law”. Ismael Moreno, a Jesuit priest and director of Radio Progreso, told Al Jazeera legislation like Article 335-B epitomises the “extreme use of law” to “exercise power over the weak”. He added that freedom of expression in Honduras is “extremely precarious” and “conditioned by the arbitrary decisions” of a government he claimed “is the product of fraud and illegal re-election”. After last year’s election, Radio Progreso’s signal went off the air in the capital in what Moreno said was an act of government-sanctioned sabotage. Moreno has not received death threats, but anonymous smear campaigns have accused him of drug trafficking, vandalism, and other crimes. He claims to have sources confirming his daily activities are surveilled by military intelligence. Like Meza and Silva, Moreno has received protective measures, in his case provided by the Inter-American Commission on Human Rights. He takes practical precautions to protect his safety, recognising his entire team is vulnerable. “It is a challenge and a responsibility to continue exercising freedom of expression despite enormous difficulties,” he said, linking restricted press freedom to attacks on other basic rights.